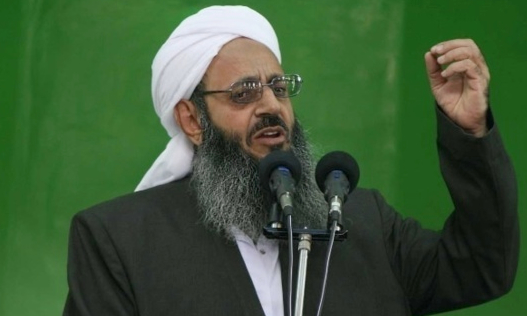 The spiritual leader of the Sunni Muslims in Iran has written a letter to his Shiite counterpart, the Iranian Supreme Leader, expressing concerns over rumors of a “secret order” which grants permission to prison officials to execute Sunnis serving time for drug related charges. Shaikh-ul-Islam Molavi AbdolHamid, a theologian and the spiritual leader of the Sunni community in Iran in his letter to Ali Khamenei speaks of a “secret order” by Sadegh Larijani, the head of Iranian judiciary which licences the execution of Sunnis convicted of drug related charges. AbdolHamid voices his grave concern and says the Sunni community in Iran also fears that the rumor is true. AbdolHamid’s office in the city of Zahedan, Iran has confirmed the sending of the letter in a release on 20 Feb 2016. The office adds that the Sunni leader has asked the Islamic Republic Supreme leader for “a wise and fatherly” intervention on this matter. Molavi Abdolhamid is well known for his advocacy of Sunni right in Iran. He has good relations with the central government in Tehran that views Abdolhamid as a moderate Sunni. In his letter Abdolhamid talks about material evidence for his claim. He points out that the number of execution of Sunnis in Iranian prisons in recent months has increased which “might be evidence” for the rumor of the existence of a secret order. Abdolhamid says the Sunni community is worried and troubled by the news of increase in the number of executions. The “Campaign of Balochi Activists” has reported six executions of Sunnis in the first two weeks of February in Birjand prison. Two of those executed were Bluchi prisoners. All six had been charged with drug trafficking. Iranian judiciary has not yet published any details about executions in Birjand prison. The number of executions, especially for drug-related offenses has increased sharply in Iran prompting the Iranian parliament to discuss the possibility of a bill to reform capital punishment laws that criminalize and punish drug-related offenses. Regardless of the discussions in the Iranian parliament, the independent Iranian judiciary continues to execute those convicted of drug-related offenses; many of those who receive the death penalty are ethnic minorities and refugees.